Contracts aren’t just the bond between you and your customer. They’re the crux of cash flow for your business. But a manual contracting process can slow down revenue generation or, at the very least, make for inefficient and time-consuming processes. 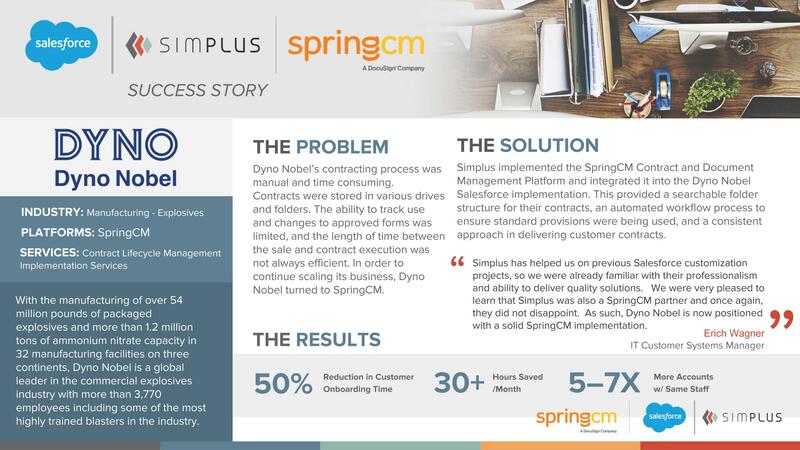 That’s exactly why Dyno Nobel, a global leader in commercial explosive manufacturing, reached out to Simplus and SpringCM, our partner in contract lifecycle management (CLM), for help. Check back every week through July 2019 for the next Salesforce | Simplus customer success story! We’ll be posting a new one every week as part of our “Simplify your quote-to-cash journey” initiative.